Christmas is arriving in a big hurry. Most of the Christmas notes have been sent to our Painter and Poet collectors. I treasure all the warm connections to family, friends and you who appreciate our painting and poetry. You fill our hearts with gratitude. 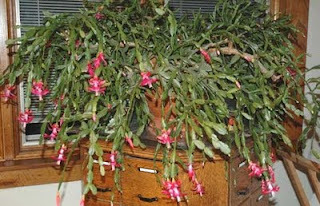 Before I was born, and prior to the "great depression" over 80 years ago, my mother grew a Christmas cactus. As a young girl I remember admiring it blooming in the living room of our Ohio farm home. My mother had a "green thumb" and her plants thrived. When I had my own home she gave me cuttings from this cactus and I enjoyed taking care of them, but none of them lived for years and years like hers did, until..... at the age of 95 she came to live with us, and along with her came some of her plants including her cactus pictured above. That was over 25 years ago and Ward and I now still have the same cactus she started so many years ago. Several times it became "sick" but it always "pulled through". Mother's Christmas Cactuis" seems very happy in my studio, a room with lots of light. And right now, it is blooming. I took this photo several days ago so I could better share its story with you.. "Mother's Christmas Cactus" prints and note cards may be found on our web site in both the Christmas series and the Floral series. Studio Update: We have just finished installing a new credit card processing program for phone and gallery orders.- now we are fully compliant with upcoming credit card safeguards. In our gallery and over the phone we are now able to accept 4 major cards - Visa, MC, Discover and American Express, as well as personal checks and money orders. While on our web site, we accept PayPal. Since our last blog, I've finished another large commission and will post a photo after it has been delivered. Within a day or two, I'll be starting another house painting - a cozy fall scene on a brick street. After Christmas, my oldest grandson, Michael, - and his girlfriend. will be visiting us on their way back to school. 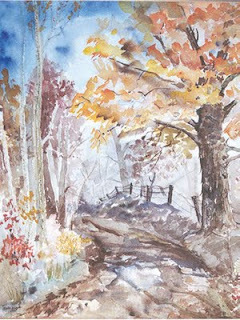 Am hoping to find time to paint a small watercolor from an awesome wooded fall scene that Michael photographed in Germany several years ago. When the painting is done, I'll share photos with you. 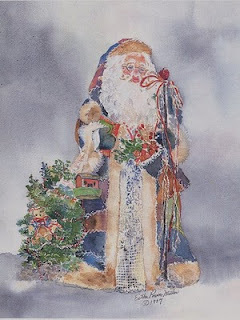 One of my "hopeful" goals for this winter is to work toward painting a small watercolor for each of my grandchildren. In my life as an artist, the lines between art and family continually blur. And I will be moving back and forth between painting and family life. Probably some paintings won't be done when I had hoped, and some Christmas notes will become New Year's notes. But Ward and I are thrilled to be happily busy - as oldsters "enjoying the journey". Thanksgiving in just SIX days! My daughter Susan and her friend Jolene, visited last weekend. The time went too fast, and a special little highlight was the good fudge that Ward whipped up. It just kept beckoning us back to the kitchen counter. On Saturday night, for dinner - Ward and I took them to City Tavern, one of our very excellent restaurants. Suzy and Jolene were pleased with the great food and enjoyed visiting some of the interesting shops here in Culver. Our town has truly "blossomed" in the last 12 to 15 years - not the same town where I moved over 50 years ago. I liked it then and I like it even better now! About a week from now we will be enjoying and giving thanks at our family gathering - not sure just who will be able to come, but we'll update you in our next blog. This is our print of the "Dome". 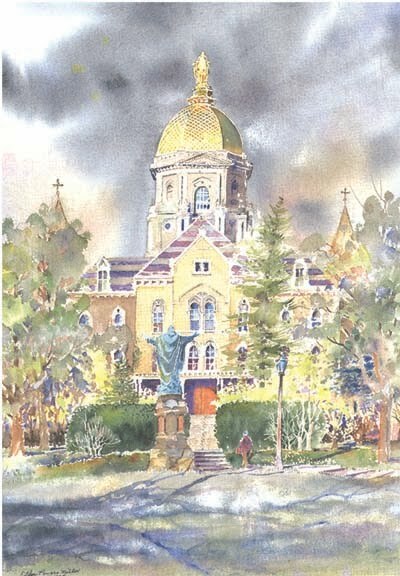 the Administration Building at Notre Dame. We offer it in a standard -11" x 14" ivory mat edged with a gold line. Consider this for the Notre Dame fan on your gift list. Go to our website or call us to order. Studio Update: We are working on our Christmas mailing. Updating addresses and printing labels. The computer and I do not always agree, but the computer ALWAYS wins. The labels are done and I'll work on the rest little by little. Culver's Vandalia Train Station print finished! Culver's Vandalia Train Station print now ready for purchase! Ward has been cutting mats, and I've been signing prints. And our new print is now posted on our web site - check there for details! Train Station prints with shiny gold and frosted silver frames are displayed in our gallery. Come in to look or buy. Can't get here? Call us and we can ship you one. It's that time of year -Fall Winter Issue - 2009 of Destination Culver, an interesting mailing sponsored by Chamber of Commerce in Culver, will be sent out in a few weeks. Chamber members in good standing are eligible to submit articles for this publication - and at last report, we are in good standing (and working on our article). Here is a photo of a painting that I did about 40 years ago, shortly after coming back from a watercolor workshop taught by John Pike, now deceased, but still very alive in my memories. He introduced me to his magical watercolors. This is a view from a wooded area near Culver Academies. I remember that my good friend, Marcia Adams, was walking with me in that woods. Then we were both full time mothers with young children, and now our children are grown and she writes (books) and I paint (pictures). Ah - the cycle of life. This weekend, we are eagerly looking forward to a visit from my daughter Suzy, who lives in Connecticut. Her husband and son are staying home, but Jolene, a good friend of Suzy's, will be with her. Special occasions like this call for old favorite foods. I baked several apple crumb pies last week and one is in the freezer - ready to pop in the oven. We have ingredients on hand for a cranberry/raspberry molded salad, and other good munchies. And I made sure we had supplies so Ward could whip up his excellent chocolate fudge - if he's in the mood. Most of our time will be spent visiting and enjoying each other, and we'll be taking them to a local restaurant or two while they are here. Our gallery will be open as usual - the door will buzz as you enter and either Ward or I will be available - and happy to greet you. Just give us a minute - we may need to walk through the house to get to the gallery. Studio Update: Getting the Vandalia Train Station Print finished has taken most of my time. Now it is complete, and on to the next project - finishing another partly done commission. With colder weather and a lot of rain, most of the leaves are off the trees. In the next several weeks, we will be taking more definitive photos of some of the commissions I hope to finish this winter. With more barren trees, it is easier to see the outlines of buildings, and I can complete a more accurate drawing. Because it is difficult to make corrections on watercolors without ruining them, a good drawing is critical. Other times - Watch for our open sign, or call ahead for an appointment. Halloween is rapidly approaching. It's a magical time of year, and today's mail brought a charming Halloween card from my oldest granddaughter, Sandra - who is a delightful independent woman. This card was addressed to me as just "Grandma Esther" with our Culver street address, and was delivered pronto. Our new windows are installed and my working studio is back in action. This morning, Ward blew our leaves into the street, and about an hour later, they were gone! Perfect timing. Thank you, Culver Street Department. Shown above is the latest print in our "Culver Indiana Series" - Culver's Train Depot is on its way. The final scan is done. Signed and numbered prints -including a brief history of railroads in the Culver area, will soon be available. Image size will be 11" x 7" and matted prints will be 17.25" x 12.25". Price from our web site: Unmatted $33.00, Double matted $39.00. Free shipping. Check our web site for details - information will be posted there before the end of this month. A book called "Hoosier Artists of the Twenty First Century - second edition " is being prepared for publication. The author, Mark Butterfield, has invited us to submit two paintings to include in this book and Culver's Train Depot and Uncle John's Barn have been accepted. We are keeping the barn painting ( named in honor of my father, John Scobie) for our private collection. The depot painting is now on display in our gallery and will be available for purchase. Studio Update: Yesterday I designed a new business card using the Welcome Culver image from my painting of the Welcome Culver sign at the north edge of Culver. This new card includes our blog site address. 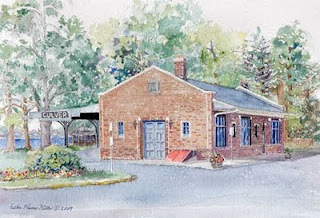 Visit our web site: www.painterandpoet.com for details on this blog's feature - Culver's Train Depot. And find out about other prints, cards, and poetry books. We've created art in a wide variety of subject matter - florals, barns, lighthouses, boats, Plymouth and Culver town and area views, childrens prints, churches, and Christmas scenes. We hope to preserve history, as well as cherished memories, feelings, and moods with Ward's pen and my brush. The full selection of Painter and Poet prints is available only through our web site and our Painter and Poet Gallery, 307 N. Main Street, Culver, IN 46511. Holiday shopping from Painter and Poet is convenient and easy. Our wide range of subject matter gives you many choices, and our updated web site gives you detailed information and an image of each print or book. We have updated our web site with a shopping cart, Pay Pal and other credit cards, for secure, safe purchasing. Free shipping within the 48 adjacent states, (call us for shipping charges to other addresses). Phone orders welcome. Just call Esther at 574-842- 8888 or email us at info@painterandpoet.com. Our prints are shipped flat, and include a foam core backing, and a signed certificate of authenticity. Each individual print is enclosed in a clear plastic bag and shipped in a padded envelope. If you are not fully satisfied with your purchase just mail it back to us within two weeks, in good condition and we will send you a full refund of the price of the artwork. If you subscribe to our blog, it will be sent to you automatically. 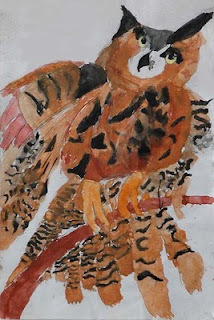 To go directly to our blog, enter this link: http://www.painterandpoet.blogspot.com/ The first page of our web site has a link to our blog. Last week we had a short but sweet visit with Melanie, my granddaughter. Grandkids are a neat bonus in life! Grandson Michael studied in Germany for 2 years, and E-mailed fall photos from his travels. As a special gift for him, I'll be painting a watercolor from one of them. Am eager to get started. perhaps to help a friend. No thanks or praise do they require. Their gift is a hand to lend. " 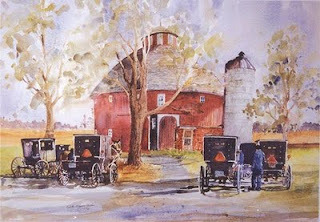 This week's feature print, Round Barn and Amish Buggies, includes Ward's poetry. It reflects the generosity and kindness of the Amish, and has remained a consistent best seller. Matted size is 20" x 16" - an easy size to frame. Matted print is only $28.00 over our web site with FREE SHIPPING inside the contiguous US states! For "out of country" shipping, please call for shipping charges. Studio update: Ward has just finished framing a nice collection of my Academy prints for a patron, and I'm almost finished with a new lake home commission - which includes an amazing curved fieldstone walk. Will post a photo after the customer has seen it. As long as we have nice weather, we plan to drive around taking photos of the fall scenery, especially interesting old barns since most of them are rapidly deteriorating. Although the newer pole barns are very functional, they are not nearly as picturesque. These photos will be an inspiration for me when the snow flies. .
Visit our web site: www.painterandpoet.com for details on this blog's feature - Round Barn and Amish Buggies, and many other prints. We've created a wide variety of subject matter - florals, barns, lighthouses, Culver Academy scenes, Plymouth and Culver town and area views, children's prints, churches, and more. We offer boxed note cards using some of our print images. We hope to preserve cherished memories, feelings and moods with Ward's pen and my brush. The full selection of Painter and Poet prints is available only through our own web site and our own Painter and Poet Gallery, located here in Culver. If you subscribe to our blog, it will be sent to you automatically. On Sale until Halloween - Big Scare in Small Town ! 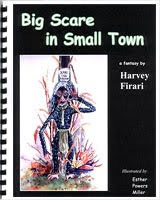 Eight years ago, Harvey Firari wrote this book - a fantasy, loosely related to Culver's annual Halloween season scarecrow contest. Noted for his marvelous mastery of acerbic wit, his book will entertain oldsters and young children alike - with many interesting "double meanings" throughout. And Esther has had the thrill of FINALLY (after age 70) achieving her life's goal of becoming a bona fide book illustrator! STUDIO UPDATE: Another productive day in my studio. Am in the middle of a house portrait. Have spent many hours working on details of the fieldstone steps in the foreground of this watercolor, with lots of careful drawing and detailed pen and ink accents. When finished I'll photograph it to share with you. Tis a day for painting! And I'm headed for my studio. Another beautiful day. The recent wonderful rains have made our impatiens plants the nicest we've ever had, and we also have VERY healthy weeds. 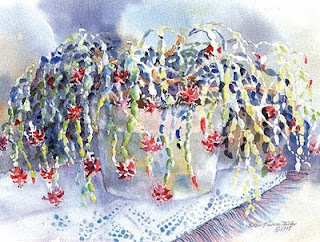 I must photograph them (the impatiens) - and try to capture them in a small watercolor. Red and white blossoms- might be nice with a small U S flag in their midst. 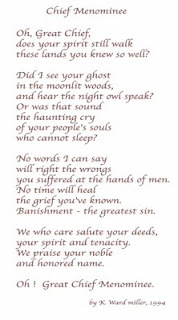 Today I helped put together several Chief Menominee prints with Ward's poem. Ward put an oak frame on one and is making a nice rustic gray frame for the other one. These have been constant sellers and a gentle reminder of the culture of the American Indian. What a great example they were - as they tried to be kind to their (now "our") environment. Amazing that it was less than 200 years ago when their culture was very dominant in our country. 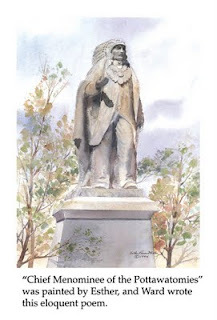 I've added the Chief Menominee image and Ward's verse to this blog. The Chief and Ward's poem are placed side by side, each in its own opening in one mat. Print includes a certificate of authenticity signed by both Esther and Ward, and a copy of the history behind this print. All Painter and Poet prints are placed on foam core backings, enclosed in clear plastic covers, and carefully packaged for free shipment inside the U. S. through U S Post Office. PayPal and other credit cards accepted on-line.